So I read an article the other day that was posted by Michelle about the scale and people’s relationships with it. In this article, it said that people that weighed themselves daily lost 13 pounds over the course of some period of time that they never specified and the people that weighed once a week lost nothing. My grandmother weighs herself and writes down the number every day and has for years. I currently only weigh myself once a week because I do not want to obsess over the number that it gives me. Now, after reading this article and what Michelle said, I feel that once I reach maintenance, I might weigh myself every day or maybe every other day just to sort of keep myself in check and make sure I maintain my maintenance. But, I can see how weighing yourself daily during a weight loss effort could be helpful, but I think that me personally, that I would obsess over the number. I mean, I have a history of eating disorder/disordered eating (depending on who you talk to is what category I fall into), and I’ve been known to engage in the use of laxatives and diuretics to affect what the scale says (and that, my dear friends, is classic eating disorder behavior). Now, what I did this weekend when I used a laxative to affect the scale, I did it only because I had not pooed in a couple days and, let me tell you (TMI in 3…2…1…) what came out did not smell good, so it had definitely been sitting in there for a few days, just stewing away. So, even though it was an eating disorder behavior, it was only once and it did serve a purpose other than affecting the number on the scale. I mean, come on, I weighed in almost 3 pounds lighter on Monday than I did on Sunday…there was definitely an issue there. Don’t be afraid for me that this is something I’m going to start doing on a regular basis. For that to happen, I would have to change my weigh in day to Monday because I am NOT taking a laxative at work on Saturday and trying to work at the same time as running to the bathroom every 30 minutes to evacuate my bowels. Yesterday I had a 3.3 mile loop planned to run. However…another cold front blew in on Monday and around midnight the sleet began. So, I sort of knew that I would be doing that 3.3 miles on the treadmill. When I woke up yesterday morning and turned on the TV there was a “special news report” interrupting the program that was scheduled to be on at that time and it was about the icy winter weather conditions. That just confirmed it. I was pretty sure the sidewalks were all iced over, so, after drinking my coffee and taking my morning vitamins and such, I got dressed and then headed up to the front of my apartments to slug it out on the ‘mill. I did better with logging the laps on my Garmin except for one lap where I accidentally hit the pause button at the same time as the lap button. D’oh! Anyway, I did 3.3 miles in 34:10. I set the pace to start off at 5.8mph (10:20 min/mi). About 2/3 of the way through the run, I bumped it down to 5.7mph (10:31 min/mi). I was comfortable the whole run except for the whole being on a treadmill part and the fact that it was boring, but I did okay and, unlike last Friday when I ran on the ‘mill as well, I didn’t have the urge to grab the handles this time toward the end of the run. When I was setting the ‘mill up for my run it had an option to preprogram the distance I wanted to run, so I did and then it did a countdown from 3.3 miles to 0.0. I didn’t like it at the end when it displayed my results…it displayed them one at a time. Of course, I really don’t like this treadmill anyway, but when I either don’t have time or it’s not safe to drive to the gym to use their nicer treadmills with TVs in front of them, it’s what I’ve got to use and while I do complain, I can’t do anything about it. When I buy a house, I do plan to buy a 4-bedroom home so I can have my master bedroom, a guest bedroom, a cat/office room, and a workout room…where I will install a treadmill and a TV with a DVD (that you can load multiple DVDs into to play one after another…LOTR marathon while running a marathon anyone? Hahahaha!). One of the errands I ran on Monday was the quest for a new bag/lunch bag for work combo. I needed a new and larger lunch cooler for my food because with it all portioned out, the containers take up LOADS of space in the backpack I was using and half the time I didn’t have space for my drinks to fit in there and had to carry them in a reusable bag. Also, if I was working a double shift, I definitely had to carry a reusable bag with not only 2 of my bottles of sparkly water but half of my food in it. I didn’t want to do this anymore. So, I found a 24-can cooler and then I went on a mission to find a bag that it would fit into. I was still holding out hopes for a backpack style bag, so I went to some military surplus stores. I did find a smaller ruck sack at $50, but it was too small for the cooler I had bought. And the next size up was the primitive camping/hiking size and waaaaaaay too big and ridiculous to be carrying to work. So, I was thinking I could just carry the lunch cooler by itself (it has a shoulder strap) and then get a nice tote to carry my drinks and other things in. I went to Walmart and looked at their backpacks and, before I settled on doing the tote idea, I went to the luggage area to see if they had a small duffel that would work for me. They have a few different sizes of duffels and I selected the 21” one and measured it’s length and width and it seemed like it would work to carry the lunch cooler in and, best part, it was only $12!!! 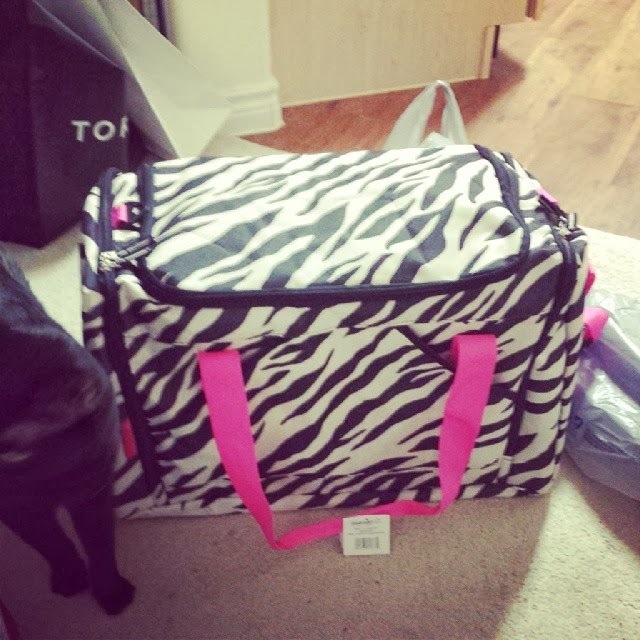 So, I get home with it and put the lunch cooler in…perfect fit with just enough room inside it to put two 1-liter bottles of sparkly water and my coffee cup in it and my magazines and such can go on the side of the cooler and then all my other items can go in the end pocket. Oh and ALL my food for an entire day fits in the new cooler with enough room to put an ice pack on the top to keep everything nice and cool!!! WOOHOO!!! No more lukewarm food! Samy wants has mentioned to me the last couple weeks that he thinks yoga would be a good idea for me. I have a yoga workout that I really LOVE…the Bob Harper’s Yoga for the Warrior workout DVD. It’s an hour long workout and it makes you sweat and I feel really good at the end of it. So, I need to figure out how to fit this workout into my busy schedule once weekly. Maybe I could do it Sundays after my long run? Or maybe I can do it Monday evenings when I get home after working out with Samy? Those are the 2 BEST days for me to fit it in, so I’m sure I can get one of them to work for me. Or it can be my Saturday morning workout…so long as I don’t have a run to “make up” from during the week that I postponed due to weather or for need of sleep…unless I have enough time to do a short 2 or 3 mile run and then the yoga workout post run…that could work too. But, then, sometimes I work overtime Friday night and can’t do any workout Saturday morning. So, I still think I need to make it work on Sunday or Monday. While I was out and about on Monday to buy the new cooler and bag for work, I managed to find 2 shirts I’ve been wanting. How cool are these tanks? They’re totally awesome! I’ve wanted them for ages…since I first saw them earlier last year sometime. 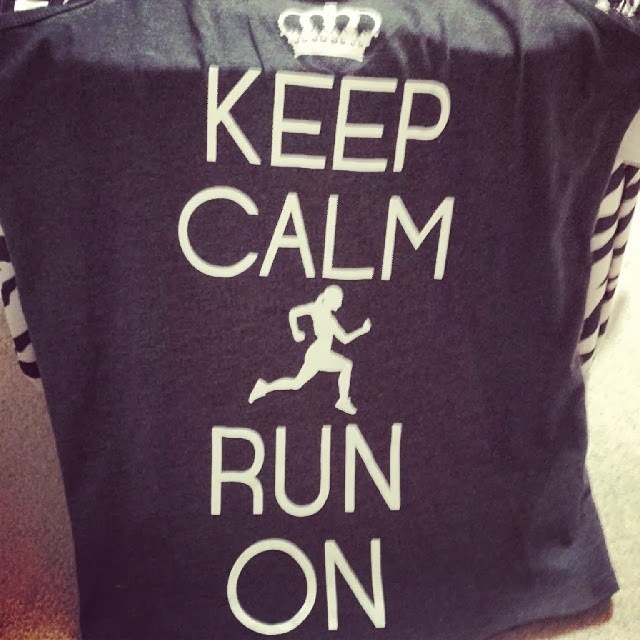 The Keep Calm And Run On one is the one I’ve been hot under the collar to find and buy. 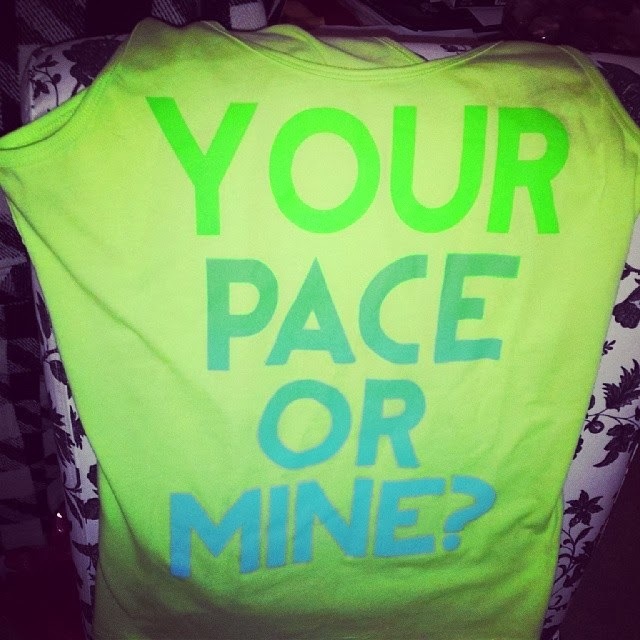 These tanks will be really nice to wear to warm weather races. I didn’t sleep well Monday night; I woke up numerous times and I just don’t think I got any quality sleep at all. So, I was up by about 9:30 am yesterday, then I was awake until I got home at about 6:15 yesterday morning and was in bed within 15 minutes of that. I figured that I would sleep well yesterday in the 5 hours I had that I could sleep…I was wrong. Seriously wrong. I probably got about 3.5 hours of sleep. It was horrible. So, I felt snacky all day yesterday. I hate it when I feel that way. I mean, overeating isn’t going to solve the problem of not getting enough sleep. I was in such a bad mood at work. So tired and craving things. All I have to say right now is that if I’m still having food cravings come the retirement party on Friday night, I WILL be ordering some sort of food at the restaurant…probably no beer though. It will have been an entire month of being “on diet” so that’ll be a nice little streak for me. I might go ahead and institute a once weekly “cheat” meal. I’m not sure yet. But if after a few weeks of being “on diet” without a slip up I have non-stop cravings to look forward to, it’s not worth it to not have a little allowance for a “cheat” meal once a week or every other week. A little note...my after dinner snack last night was scheduled to be 2 rice cakes with a little peanut butter on them. So, since I sometimes tweak the serving sizes of some of my snacks (a small sweet potato instead of half of a regular one, a whole small avocado instead of a half of one, etc), I decided having a 3rd rice cake with pb on it wouldn't be any different than that and that's what I did. Afterward, the snacky feeling went away and I felt satisfied food-wise. Today I’ll be running 3 miles, which means I can sleep in until 10am…YAY! I’ll run my little 3 mile loop that I like. It’s easy and a fast run for me. Then tomorrow morning I’ll run my errands and pay bills before work. Saturday I’ll either just run (most likely since I’ll be staying out past midnight for the party on Friday night) 2 or 3 miles or I’ll run a quick 2 miles and do a gym workout…or just a gym workout (as I will have already hit 3 runs for the week with tomorrow morning’s 3 miler). We’ll see how I feel and at what time I wake up Saturday. Maybe I’ll just go get my nails done and not workout at all. Hahaha!